Buy Now A coupon is available! Click to see the coupon code. This is a Buy 1 Get 2 FREE offer! Go to Store A coupon is available! Click to see the coupon code. This is a Buy 1 Get 2 FREE offer! Microcrystalline Cellulose, Dicalcium Phosphate Dihydrate, Croscarmellose Sodium, Stearic Acid, Hydroyxpropyl Cellulose, Purified Water, Coating (Hypromellose, Glycerin), Silicon Dioxide, Magnesium Stearate. PureXen is committed to delivering only premium ingredients. Our products are produced in cGMP facilities. 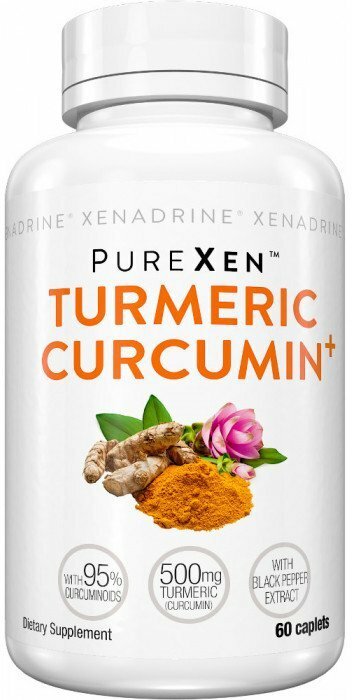 Turmeric Curcumin is non-GMO, gluten free and vegetarian friendly with no artificial colors, flavors or sweeteners. There are no proprietary blends, just pure ingredients to feel good about. To support turmeric intake: Take 1 serving (1 caplet) twice daily. For weight loss: Take 2 servings (2 caplets) 30 to 60 minutes before your 2 largest meals. 60 Capsules This is a Buy 1 Get 2 FREE offer!